2015 Finish Along to the rescue? Cause I still lack the routine and sometimes motivation to sew regularly – maybe this helps. Moving forward with my WIP list will otherwise be tedious and nearly impossible. So, here is my list of proposed finishes for the second quarter 2015. 4. and 5. Those two quilts have once been pieced for a bigger quilting idea, but I don’t like them enough anymore to continue this. So I am rather going to arrange them in two baby quilts then being unfished and unwanted in my home. As for the charity quilts: I do not really now a way to give away charity quilts here in Hamburg, Germany. So I contacted the neonatal station where the grandson of my colleague was born. They are interested – though they may think I have forgotten about them in the interim. I hope this quarter will help me change that as well. 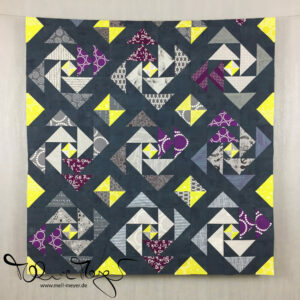 Linking up at WIP Wednesday @ Freshly Pieced and Finish Along 2015 @On the Windy Side. This is quite a list to finish is such a short time… more power to you und sehr mutig! For #3, you could use one of your Comma fabrcs for (I could see the ZC red star #10 from the bottom), a squared elements, or to make it kind of ecclectic use one of your AG florals. You could also do a pieced backing. I’ve been thinking a lot about doing charity quilts too… maybe we should put it on the list of things to talk about. Crossing my fingers, drucken die Daumen for you! 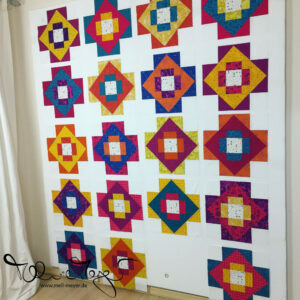 Hah — I have that same problem of wishing certain quilts would finish themselves when I do not feel like working on them anymore! 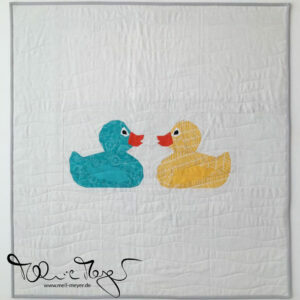 I think it’s a great idea to turn some of your WIPs into baby quilts. Even if you do not have a recipient in mind for them now, it would be nice to have a few finished baby quilts ready and waiting for the next baby shower invitation to arrive. I love the energy of your bright and cheerful fabrics. Anyone who receives your quilts as a gift or through charity will feel loved and blessed.